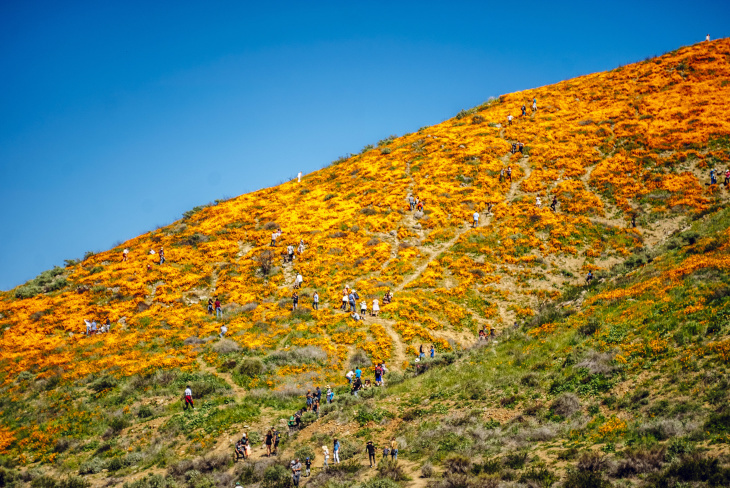 As superbloom tourism continues to sprout up across Southern California hillsides, one particular flower is drawing much of the spotlight: the California poppy. We've reported on their trampling, on viewing etiquette, on social media trends and on the $10 shuttle and parking restrictions that were enacted after a particularly chaotic weekend in Lake Elsinore. But what do you know about this flower? Well, now you can know some of these things that Assistant Professor Joshua Der from Cal State Fullerton knows. He specializes in California native plants and now you sort of will too, with this handy list of facts. It's the California state flower. "Eschscholzia californica" was first cultivated in the Southwest in the 1800s. It was selected for its state flower title in 1904. Native tribes like the Luiseno, Cahuilla, Costanoan and Pomo have used the California poppy for food — they were boiled or steamed to be eaten like green veggies. The flowers were also used for medicine — to treat toothaches, headaches, sores, kill lice and as a sedative for babies (but the chemical compounds suggest only minor benefits). They explode. After the bright orange blooms fallen away, the fruit that remains turns into a party-popper, bursting its seeds up to three feet away. But they're safe and non-narcotic. California poppies are but cousins to those other poppies. They hug themselves. The flowers keep themselves warm and alive by closing their petals like a tiny, living umbrella. The delicate petals and stems will fall apart within minutes if you pick them. DO NOT PICK THEM. Also, they will not bounce back if you crush them with your human feet or body. Keep a respectful distance.